The Social Assistance Summaries series tracks the number of recipients of social assistance (welfare payments) in each province and territory. Social assistance is the income program of last resort. It is intended for those who have exhausted all other means of financial support. Every province and territory has its own social assistance program(s) and no two are the same. Prince Edward Island delivers both a Social Assistance Program and a Disability Support Program. The Social Assistance Program delivers benefits on a case-by-case basis to residents who meet the eligibility requirements. The amount of financial support available varies depending on the individual’s circumstances, such as the number of dependents in the household and whether they are a home owner. Assistance may include help with food and shelter costs, personal expenses, medical, dental, and optical care, and help with funeral costs. The Disability Support Program (DSP) was the first program in Canada to distinguish disability-specific support from social assistance. It is not an income support program. Instead DSP assists with personal planning and helps meet the needs related to an individual’s disability. These supports are needs-based and are not intended to provide income. Nor are they meant to duplicate or replicate existing services. Supports are provided in three main areas: child disability supports, adult disability supports, and employment and vocational supports. They may take a number of different forms such as funds for respite care, community living and community participation programs, technical aids, and other devices. How many people claim social assistance? On average, there were 3,600 cases (families and single adults) in Prince Edward Island’s Social Assistance Program during 2017/18. This number fell in the late 1990s and early 2000s but has been reasonably stable over the last decade. On average 5,400 people (individual claimants, their partners, and dependent children) benefited from social assistance in 2017/18. On average, 1,400 individuals received support through the Disability Support Program (which is not an income support program). 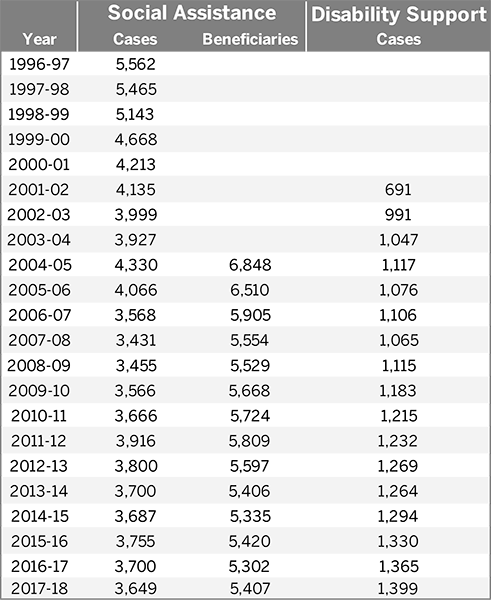 The number of cases has risen gradually since its introduction in 2001/02. Further breakdowns of social assistance data in Prince Edward Island can be found on the province’s website.